The CL1008M, 17" LCD integraded 8-port KVM switch, is line of SMB-class KVM solution from ATEN. This LCD built in unit provides one local user access and support up to 96 servers through daisy chaining. The user can use push button, hotkeys, or OSD to select the desired computer. For additional security, CL1008M offiers two levels passwords, administrator and user. IT administrator can control the user access done to the port level of the KVM. CL1008M is in the ready to install condition. It's all-in-one design avoids the extra assembling requests to put LCD module and KVM box together. Additionally, ATEN's friendly design reduce the complex steps to install the unit to the rack. 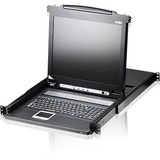 Product Description: ATEN CL1008M, KVM console, TFT, 17"